[V1.5.0.0 Release Note] Feature Introduction: - In-app Forecast - Update much faster and save more data. - MoWeatherTile - Information volume upgraded. - Icon Savvy - Better climate icon redesigned. Update Note: - Fixed tile update issue. - Fixed app crash issue. - Fixed city list notification issue. - Fixed picture compress issue. - Improved pull down refresh feature on notification page. - Improved profile picture feature on my page. - Improved weather sharing content. MoWeather cares your feedback. For further app improvement, please contact support@moweather.com. [V1.4.0.0 Release Note] - Fixed all reported issues of refresh/tile flip disability from last update. - Performance improvements. Please directly contact us via email to support@moweather.com for any unexpected issues. 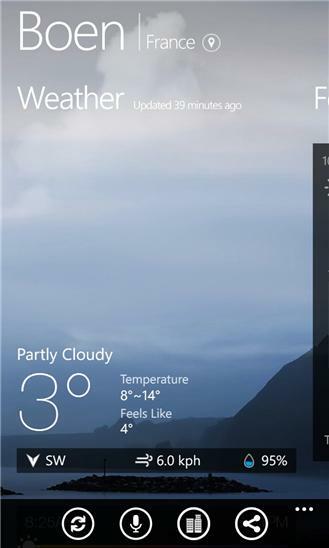 [V1.3.0.0 Realse Note] - Enable weather sharing on Facebook and WeChat. - Add app rating guide. 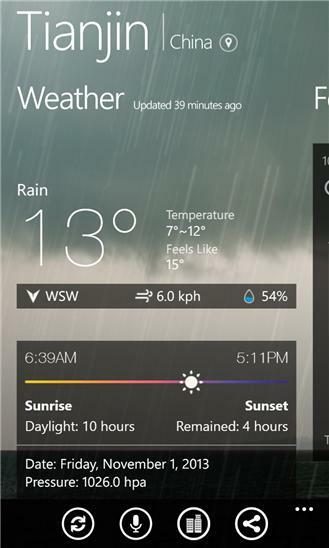 - Upgrade tile weather auto refresh feature. - Fixed 12+ bugs. [V1.2.5.0 Realse Note] - New lockscreen and live tile design. - Update weather data of tile and lockscreen timely. - Support 3 kinds of tile and 6 ways to flip. - Fix locating bug. Improve access to accurate local weathergfh. - Support 21 countries and regions. [1.2.0.1 Realse Note] - Add doulbe-click-to-exist feature. - Increase language option up to three (English, Simplified Chinese and Traditional Chinese). - Support switch feature between Celsius and Fahrenheit. - Launch rainy weather dynamic background. - Fix 10+ bugs. WP version MoWeather is an app Jeeves (from Jeeves & Wooster) on well monitoring your day-by-day activities and travel plans on both personal and business level. MoWeather helps you to trigger a better day with easy fingertip motion anywhere anytime anyhow. Features: 1. Accurate weather info covers over 100,000 cities all around the world. 2. Beautiful auto update weather background animation. 3. Metric style 11-day advanced weather forecast. 4. City pocket holds more than 5 locations. 5. “Weather Siri” in-time broadcast. 6. Lock Screen (Two options). 7. Flip Tile (Three sizes). 8. Trilingual support. 9. No ad guarantee! Follow us: Facebook: https://www.facebook.com/MoWeatherApp Twitter: https://twitter.com/MojiWeather Google Plus: https://plus.google.com/+Moweather Contact us: contact@moweather.com No matter how the weather change, rainy, sunny, cloudy, snowy, tornado, etc. MoWeather will always be with you! MoWeather, we make a better day altogether!